I started this blog last February and on the occasion of this my 100th post I thought I would show a glimpse of the technological wonder known as Google Analytics. 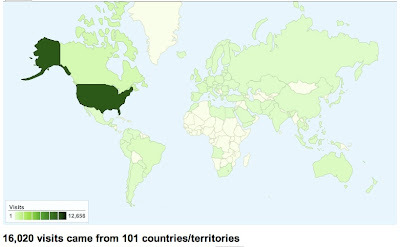 With this tool I can see how many people stop by my blog and where they come from. 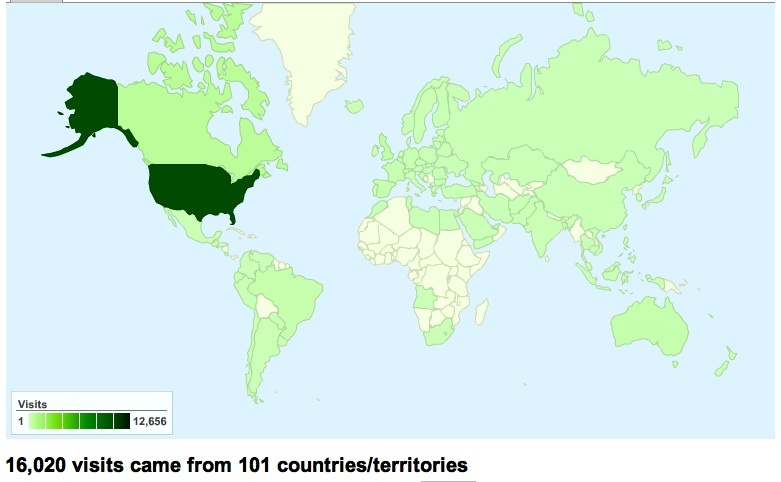 Though I can't see who they are of course, I am thrilled to have readers in places so exotic—to me at least—as Iran, Angola, Yeman, Paraguay, Slovenia, Jakarta and Romania. I would like to give a приветствие to my reader in Atyrau, Kazakhstan. 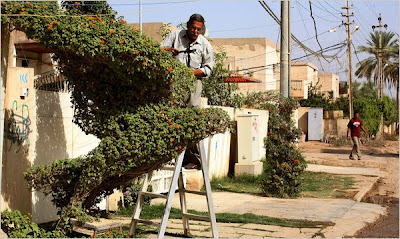 I picture you sitting at your computer thinking of gardens in an apartment overlooking the Ural River where it runs into the salty, landlocked Caspian Sea. And to my pal in Iceland, I think I know who you are: halló yndi, koma aftur bráðum. And to all the rest of you in places as exotic as Van Nuys, Boise, and Utica, thank you for checking in from time to time and also thank you for being patient with my erratic posting schedule. I look forward to your next visit. I have to admit when I first heard that British author Anna Pavord's new book was about bulbs I thought, "Oh well...". Ms. Pavord's most well known book is The Tulip, and its justly famous. However this time, I felt it might be a bit boring to run down this similar well-trodden path yet again. I already own a lot of books on bulbs, ranging from reference titles like Taylor's Guide to Bulbs to very personal books such as The Little Bulbs by Elizabeth Lawrence. This time I was wrong. First off, Bulb is filled with Ms. Pavord's first-hand horticultural knowledge of all the bulbs that are presented in its pages. I was lucky to meet the author at a dinner last week and she told our small group that she had grown every one of the 600 varieties about which she writes so beautifully. Friends, in today's throwaway society this experience is rare and exceedingly valuable. True their will be growing differences between her British climate and all of the ones we have here but one of the nice things about buying bulbs is that they come programmed to thrive. Each is a little packet of success (at least for the first year). Secondly, this book is gorgeous and I never use that word. But yes it is, thick and heavy and filled with evocative photographs by Andrew Lawson and Torie Chugg. It's nice to see a work where the passion of the text and the visuals are so successfully married by such elegant design and art direction. Now you must also know that the book is huge. At 544 pages and weighing over four pounds, it is not the sort of reading material that even the most die-hard gardener will take on a winter's beach vacation. However, it is precisely the sort that a person, namely me, will love to have on the nightstand and savor bit by bit, bulb by bulb before going to sleep. In her acknowledgements Ms. Pavord writes, "I spend more on bulbs than clothes." And though she looked perfectly lovely at the recent dinner in her honor, I and so many other gardeners are blessed that she has chosen to use her money so wisely. 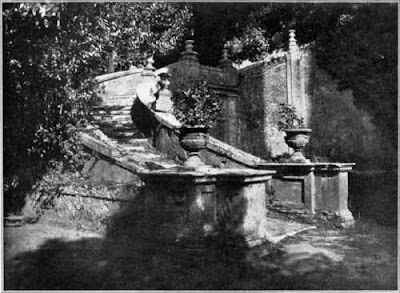 The poet's narcissus grows in a meadow in Greece, above. I did a short review of Dan Pearson's intriguing new book for the New York Times today. 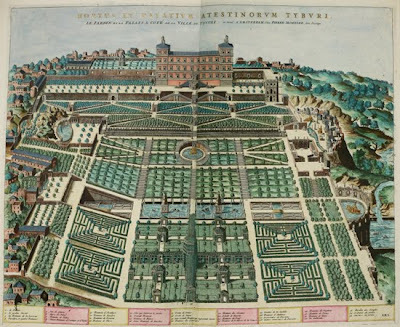 Books written by garden designers can often turn out to be ersatz portfolios meant to promote the author’s own projects for posterity’s sake. 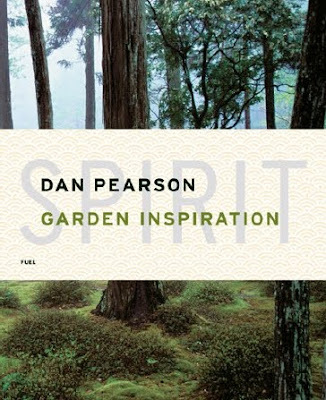 English landscape designer Dan Pearson has written a new book that does quite the opposite. 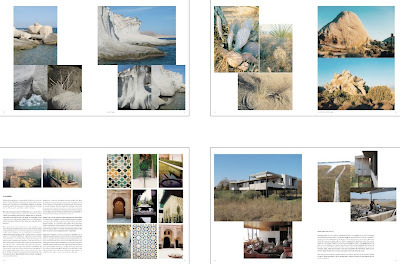 Seen as a group, the photographs of gardens, art and landscapes, mainly taken by Mr. Pearson around the world over the past couple of decades, focus his creative eye into something that lies between the introverted style of a diary and the best, most idiosyncratic aspects of a blog given permanence between hard covers. I just came across these forgotten photographs from a summer weekend upstate. Our friends wanted to make terrariums in a group of lidded canisters they bought at an antique store. So they went around the yard and the forest and picked up little woodland bits to put in them. I think they look really beautiful. I hear that now that the terrariums have gone home with their makers, the ferns are doing pretty well even months later but of course the mushrooms have disappeared. My friend Johanna has mad styling skills so it was no surprise that her terrarium (above and below) was the best. You might remember her cut-paper jungle wall here. Afterwards, we all watched Juliet of the Spirits and took naps. My love for the First Lady knows no bounds. I particularly appreciate the consistency of her gardening message as she helps celebrate Sesame Street's 40th birthday today. 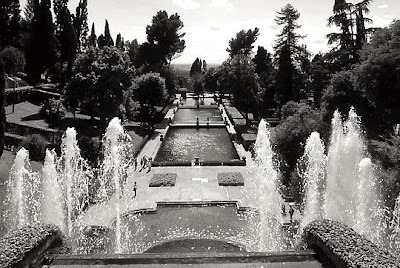 How often is it that a 16th-century Italian Renaissance garden comes up twice in the same week? Even for me, that's odd. So I thought it deserved a post. 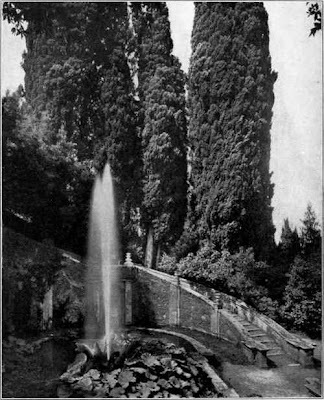 First, I was helping my friends Clay and Ross plan an upcoming trip to Italy and advised them to visit Tivoli near Rome for the justly famous twofer of Hadrian's Villa and Villa d'Este. 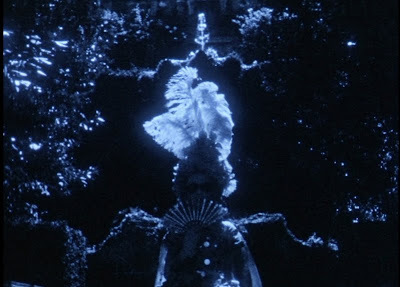 Soon after, as I was reading English landscape designer Dan Pearson's new book, Spirit: Garden Inspiration for a review, he wrote that he had first been inspired to visit the latter garden after seeing the experimental 1953 film by Kenneth Anger, Eaux d'Artifice. 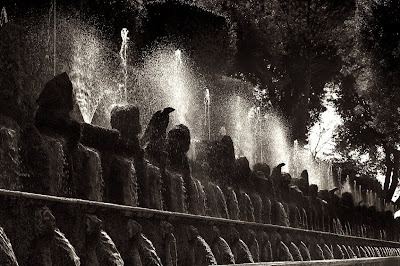 I had seen the film years ago but had forgotten how haunting it is. 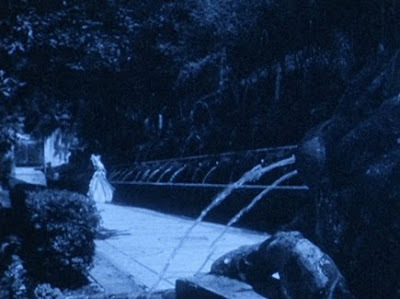 Even in its non-online form, the cinematography seems purposefully dark and murky as if filmed by moonlight and tinted in the manner of an old silent film. 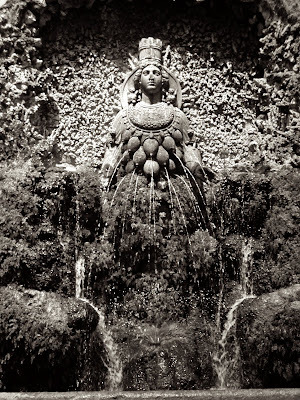 Eaux d'Artifice, a play on the French phrase for fireworks "feux d'artifice" and a reference to another more controversial Kenneth Anger film, is all about water just like the garden it features. 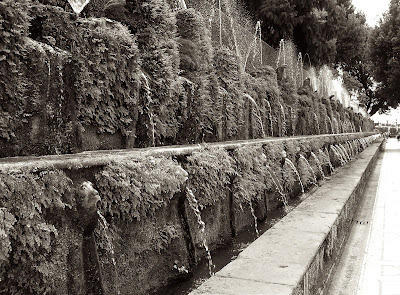 Back-lit water splashes, sprinkles and cascades all around the shaded walks and architecture of the hillside estate. Meanwhile a ghostly figure dressed for a masquerade runs through the fantastical scenes to suitably baroque compositions by Vivaldi. Her odd appearance and gait is heightened by the fact that Anger hired Carmilla Salvatorelli, a small-sized circus performer, for the role at the recommendation of Federico Fellini. 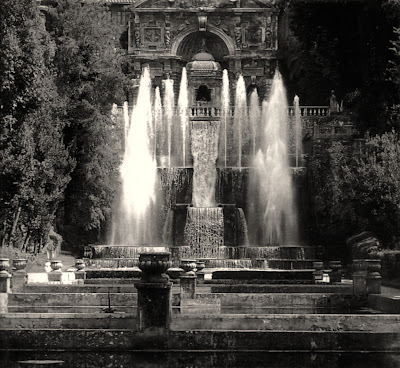 I have to admit if I was by myself in the Villa d'Este during a full moon and I saw little Carmilla trotting purposefully toward me I would be a little alarmed. Watch the 12 1/2 minute film below. Even though the quality is lacking, you still have to love the internet. 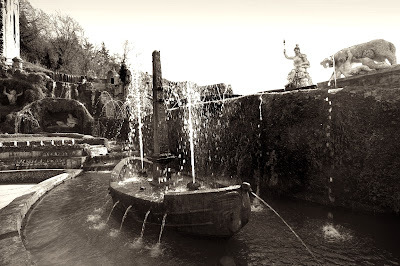 Below are more photographs of the garden in all of its strange glory, very much a monument to hydraulics and the power of water at the mercy of gravity.